Soft to the touch, versatile, packs easily, and great for layering and all weather conditions. 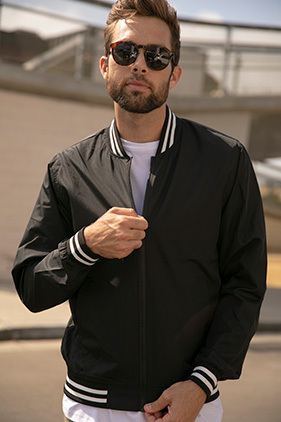 100% polyester lightweight bomber jacket with 100% polyester fabric with interior water resistant coating. 1x1 ribbing. Waterproof pressure resistance: 600 mm. #5 Vislon Zipper. Self neck tape. Welt pockets. Locker loop in center back. Tear away label.